Our range of high performance reverse osmosis chemicals are based on advanced formulations and include RO membrane cleaners and detergents, scale inhibitors and antiscalants, corrosion inhibitors, biocides, antifoulants, de-chlorinators and flocculants. We also provide advanced chemical formulations for the international membrane filtration and reverse osmosis markets and offer several key performance benefits including cost, convenience, operational performance and environmental impact. ACURO'S reverse osmosis chemicals are scientifically formulated to help optimise reverse osmosis recovery rates, improve operational efficiency of RO plant installations; and reduce problems associated with scaling and corrosion. ACURO's Food Grade RO antiscalant/dispersant is a high performance chemical pretreatment that controls inorganic salts, metal hydroxides, and colloids in RO feedwater. Its unique performance characteristics provide users with more complete control of system feed water chemistry, reducing membrane fouling and minimizing cleaning requirements. 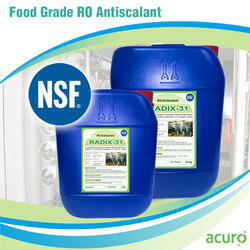 ACURO's Food Grade RO antiscalant is compatible with all membrane types and system components. (1). Inhibit inorganic scale formation for a wide concentration span, the largest permitted value is 2.8 when no acid is added. (3). Inhibit the pollution from ferric, aluminium or heavy metals pollutants. The permitted ferric concentration for inlet water supply can reach to 8.0ppm. (4). Inhibit the flocculate and deposit of silica, the permitted silica concentration for condense side can reach to 290ppm. (5). 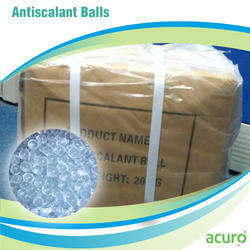 Be used in CA, TFC, NF and UF membranes for RO system. (6). Good solubility and stability. (7). Effective in pH 5-10. RADIX 39 is a high performance reverse osmosis (RO) antiscalant and dispersant, scientifically formulated for the treatment and protection of reverse osmosis membranes under high silica feed water conditions. 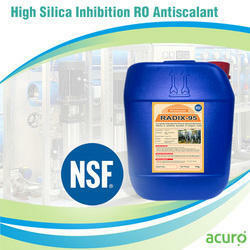 A proprietary blend, RADIX 39 has been specifically designed for ro membrane systems with high silica feed-waters. Scaling and deposits build up on the reverse osmosis membranes leading to poor permeate quality, low permeate production and increased water and energy costs. RADIX 39 is a proven high performance scale inhibitor against calcium carbonate and calcium sulfate scalants and combats silica fouling by a combination of anti-precipitation, anti-agglomeration and dispersancy processes. RADIX 39 is compatible with a wide range of materials and unlike other antiscalants, is not deactivated in the presence of iron. RADIX 95 is an RO membrane scale inhibitor and has been developed specifically for use with high silica waters and is a synergistic blend of threshold antiscalants and dispersants. Precipitation of scale on RO membranes will reduce system performance and lead to premature membrane replacement. Build-up of scale and deposits on RO membrane leads to poor permeate quality, low permeate production, unscheduled downtime, increased water consumption and increased energy costs. 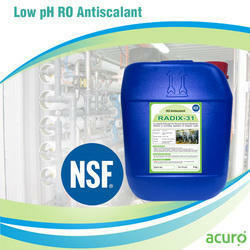 RADIX 95 allows plant operation with concentrate silica levels up to 230 mg/l at pH 7.5 and 30C. RADIX 95 is not deactivated by the presence of iron or manganese and is an effective scale inhibitor against all insoluble calcium salts. 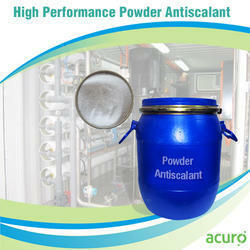 Effective silica and calcium salt antifoulant in all water types. Suitable for use with polyamide thin film composite and cellulose acetate membranes. Liquid product, safe and easy to handle. Enables recovery rates to be maximised. RADIX 31 is a broad spectrum antiscalant which is recommended for controlling inorganic scales found in surface, ground & sea water. RO antiscalant is highly effective liquid antiscalant developed to control scale precipitates and reduce particulate fouling within membrane separation systems.It can be used in reverse osmosis (RO), nano-filtration (NF) and ultra-filtration (UF) system. It is compatible with all of the leading RO membranes. It can extend the membrane life and reduce the running cost. It is particularly suitable for treatment of the groundwater and the water with high content of calcium and magnesium ion. It complies to ANSL/NSF60 Standard. 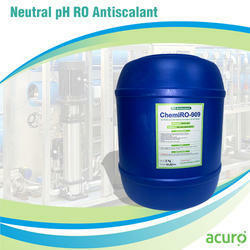 ACURO manufacturers neutral pH RO Antiscalant for specificity applications. 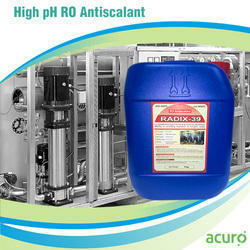 RADOX AS213 antiscalant/dispersant is a high performance chemical pretreatment that controls inorganic salts, metal hydroxides, and colloids in RO feedwater. Its unique performance characteristics provide users with more complete control of system feed water chemistry, reducing membrane fouling and minimizing cleaning requirements. RADOX AS213 is compatible with all membrane types and system components. 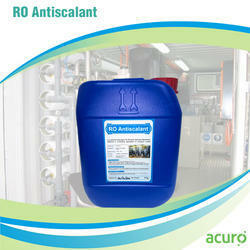 Looking for RO ANTISCALANTS ?